It�s good to see these fine recordings returning to the catalogue again. In this mid-price �Great Recordings of the Century� form the coupling represents fantastic value. The Enigma performance is a good one, not a great one, but Boult�s Planets is something else. He conducted both premières of this astonishing work of course, (the private one in 1918 and the public one the following year) and was closely associated with it throughout his career. In fact this recording is one of the last he made, and seems a true distillation of his deep knowledge of the work and deep love for it, too. Boult�s gentlemanly appearance and restrained style could be misleading; anyone who played for him will recall that he gave his orchestra a unique freedom, through both the clarity of his direction and the obvious completeness of his preparation, the results being, at their best, playing of passionate commitment. Temperamentally, he seems to have been closer to Holst and Vaughan Williams than to Elgar. I remember hearing his early recording of Mars the Bringer of War, made with the BBC SO in 1948, when I was a child, and it frightened the pants off me! He never lost the ability to turn in a blood-curdling Mars, as this one testifies. He drives the music on relentlessly, and hammers home the massive concluding discords with merciless violence. The other Planets are on a par with this. Venus receives greater tranquillity and beauty than I think I�ve ever heard, and, although Mercury is let down by some slightly untidy woodwind playing, it buzzes along at a tremendous pace. Jupiter, on the other hand, has a magnificent breadth to it. The opening may seem a little slow, but Boult�s grand plan soon emerges; the piece builds up inexorably to the most thrilling ending possible. The �big� tune in the middle, conversely, moves along smoothly and not too slowly, allowing the piece to remain good-humoured and never to become pompous. The recording catches brilliantly the high C in the trumpet at the top of the final staccato chord. Saturn continues this white-hot level of performance, rising to a truly panic-stricken climax, with the manic clanging of the bells. 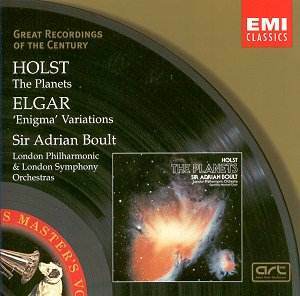 Just a few question-marks over the quality of the brass playing at the peak of the climax; Holst asks a great deal here, but the sound of the brass choir needs to be fully integrated, even at the very loudest moments. The trumpets over-balance the ensemble. However, the closing pages achieve a mellow serenity which has never been surpassed on disc to my knowledge. Uranus and Neptune are equally fine, with the off-stage Geoffrey Mitchell Choir (not The Black and White Minstrels, you�ll be glad to hear) captured superbly by the engineers, and contributing exactly the right icy purity to the end of this great masterpiece. In fact this is a landmark recording, surely one of the finest EMI had made up, to this point, and it still sounds fantastic. So many details in the score come over with perfect clarity allied with the right perspective, and I cheered out loud when I heard the famed organ glissando in Uranus - famed, yes, but usually totally inaudible! No, the Enigma performance is not on the same level. It is a fine performance, with some lovely playing, and delightfully characterised variations, particularly the lighter ones. But it suffers from a rather sluggish Theme, and a Finale which oddly runs out of steam, as if Sir Adrian just wasn�t feeling like it that day! There are some balance problems, too, for example at the beginning of Variation 2, with its semiquavers passing rapidly from 1st to 2nd violins. This is ironic, as Boult always insisted on having the two groups of violins facing each other across the platform, firsts on his left, seconds on his right - where most conductors place the 'cellos - and his reason was precisely to deal with passages such as this. That said, this is still very much a performance worth hearing, and the coupling does indeed make it a great buy.